A ground electrode essentially serves as a good conducting medium that is in contact with groundmass. A good ground electrode connection ensures safe and smooth evacuation of current from ground connections in to the ground. Copper Rod or Galvanized Iron (GI) pipe rod or Copper Plate. The choice of electrode depends on the type of application, location. Local standards and rules that govern the choice of electrodes. It is one of the most important factors that influence the performance of grounding system. There are country specific standards on maximum value of soil resistivity to be considered while doing grounding. National Electric Code (NEC) recommends the maximum value of Soil Resistance to be at 25 Ohms. However, it is always desirable to keep this value at a minimum. The tolerance values also goes down depending on the class of Electrical installation (LV, HV, EHV). 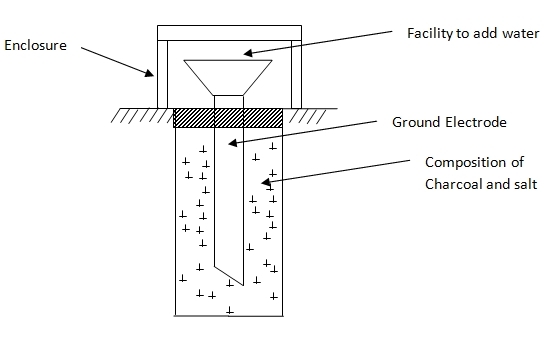 It is important to bury the Ground electrode at an adequate depth inside the ground mass. This ensure that the electrode is connected at least soil resistivity value. The depth of ground electrode varies based on each site location and the quality of soil. Normally the layer of soil closer to ground level has the highest resistance value which decreases as we go down deep inside the earth. Also, a rocky soil negatively impacts the soil resistance (increases it). Due to these facts, It is usual to find ground electrodes buried at depths between 8 Feet to 10 Feet where soil resistivity could be in permissible range of 2 to 25 Ohms. Moisture content in soil helps to keep the soil resistivity value under control. A dry soil offers higher resistance than a moist soil since moisture content increases the presence of electrolytes in the soil. This in turn decreases the resistivity of the soil. It is a customary practice to keep the ground electrode area always in a hydrated state by various external means. Normally in case of a rod type ground electrode, the opening outside the ground is provided with a funnel shaped apparatus to pour water inside. It is also a common practice to form a circular ditch around the ground electrode rod and fill it with electrolytic material like: Rock Salt, Charcoal etc. This combination helps to prevent the moisture in the soil from getting evaporated. In some special cases where it is difficult to maintain moisture content and soil resistivity, the ground electrode and its pit is treated with chemical compound that helps to retain the moisture content and thus prevents it from getting evaporated to outside atmosphere. Soil temperature also has some effect on the soil resistivity. Soil resistance increases with lowering temperatures of the soil. It is significantly higher in case of frozen soil areas. In many cases where there are large facilities involved, it is common practice to use a Multi-Point Grounding System. In this type of system, an underground ground platform (grid) is built. This type of configuration establishes multiple conductive paths from various connected equipments and a common ground. Irrespective of the type of grounding system, the performance of grounding system thus depends on variety of factors as discussed above. It is therefore critical that the grounding system is constantly monitored. It is important to study the local soil conditions and soil resistivity values and also check the local applicable standards for grounding before commencing the work. or copy this trackback: http://engineering.electrical-equipment.org/electrical-distribution/ground-electrode.html/trackback from your own site.